The OSUsed Store is open for its weekly afternoon public sale today. 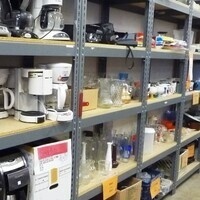 Merchandise includes used furniture (desks, file cabinets, tables, chairs, bookcases, etc. ), computers and computer accessories, office supplies, bicycles, household items, and much more. Public sales are held Tuesdays 5:30-7:30 p.m. and Fridays 12-3 p.m. and provide an opportunity for the general public to make personal purchases. Staff may shop for their department, government agency, or nonprofit on Mondays through Thursdays at 8:00 a.m. - 4:00 p.m.
For more information, please visit http://fa.oregonstate.edu/surplus.